Here is a simple IR audio link that can be used to transmit audio signals up to 4 meters. The signal to be transmitted is applied to the base of Q1 via resistor R4.The transistor Q1 drives the IR transmitting diodes D1 and D2.The audio input will be modulated to the IR signals transmitted. The transmitted IR signals will be picked by the photo transistor Q2.The emitter voltage of the transistor Q2 will change according to the sound modulated to the IR signal. The transistors Q3 and Q4 amplifies this signal to drive the speaker or headphone.C1 and R3 forms a filter to avoid interference from stray IR signals. The circuit can be assembled on a general purpose PCB. Use 9V PP3 batteries for powering the transmitter and receiver. The phototransistor Q2 can be any NPN phototransistor like PNZ154, PNA1605F, BPW77NA or BPW85. An 8 Ohm speaker or a headphone can be used to hear the sound. Kindly tell me that where is the base of photo transistor to be attached? What is D2, D1, Q2??? what does mean audio in & audio out. Hi,I want to use this transmitter and receiver to send a data,data is not sound and is straem of ones and zeros bits. is it possible?! and is it possible to use 5 volt for power.beacause I want to use it in usb system.thanks for ur answer. sir plz help me how to identify pins of 3 pin photo transistor? ? sir, can connect microphone directly to the audio input? sir, is the circuit above simulated on breadboard or in proteus? have you build it already? is it working? can i use tsop1838 phototransistor….please replay. sir,i have small confusion in the circuit that,i have 1 micro f 6.3V CAPACITOR AND 1 micro f 63V CAPACITOR and 1 micro f 100V CAPACITOR,which is the capacitor used in receiver circuit. is their circuit has 2 IR DIOD ? to transmit the signal ???? if its true then what is the value of ir Diod ????????? TIL38 IR diodes which are freely available can be used. Two are used for better radiation pattern. sir can you please explain how modulation takes place. Can i used here 5v instead of 9v? because my power supply is 5v only. in the cicuit at the AUDIO IN can i place microphone and at the AUDIO OUT can i place 8 OHMS loud speaker . then that this circuit works? This is awesome. Very simple to make. Thanks a lot! If i do not have Transistor BC 548. What kind of transistor can i replace it with? One more question, what kind of filter are you using in this project? How can we compute the cutoff frequency of this filter? the microphone in this circuit isn’t working (although when checked separately its in working state) what should i do? This circuit is garbage. Q1 is not biased at all. If the Audio IN signal is AC, Q1 will only turn on for those portions of the signal that exceed 0.7V, resulting in severe distortion. Whoever designed this must think that transistors are self-biasing amplifiers, like op-amps: just add power through a load, and your input, and it’s good to go. Another problem is that Q1 has no emitter resistor at all. The circuit is aiming for maximum gain. Unfortunately, not only does that mean lots of nonlinearity, but also suboptimal input impedance. Basically the input impedance is just the 1K resistor plus the base-emitter junction’s ESR. That may be too low to be driven by some sources. Hello Sir Seetharaman, May I ask about C1,What Kind of Capacitor will I used? and the number code of Capacitor? Hi Nilanjan Roy if the transistor is quite cheap, you can use it after painting its body with black paint. Thanks for the information, seetharaman, it really helps me, making my project! mins what u talk , i did not get u ??? what type of capacitor is used in the circuit? What is the purpose of using two LEDs? For biasing, do we need to connect Q1 base to Vcc? For example, in case where the input signal goes below zero, how will the Q1 be biased if it is not connected to Vcc? Hi Badri please read about RC filters you will understand. Use 470PF ceramic disc in parallel with the input and an isolation capacitor 0.22uF ceramic disc between input and Q1 base. my question:how do you calculate this value of capacitor? and what is the value of resistance in RC filter? i see in oscilloscope after transistor Q1 in side collector, the signal is cutting in up side .why? Hi Freeze Use 470PF ceramic disc in parallel with the input and an isolation capacitor 0.22uF ceramic disc between input and Q1 base. During the application design I found noise. Hi Freeze to list afew IR323, QEC112,113, IR-204, CQY37N, IR333C, OP297AB. can i have more material about this circuits? sir. may i know the viewing angle of the phototransister? Hi Kiran it is from the transmitter. the current through the standard market IR LED is around 10mA, through R1 there will be a drop of 10volts which is not possible hence low current will flow through LEDs and Q1. Each LED requires 1.3 volt at 10mA a drop of 4 volt is required. 4 / 0.01 is 400 ohms reduce R1 to 390 ohms and add a resistance of 22K between collector and base of Q1. add an isolation capacitor of 0.22uF ceramic disc from input to Q1 base. It looks your audio input is of very low impedance you are facing the distortion problem. The above modifications will cater to your requirement. hi sir thanks a lot i made it and its working but with some noise.can u tell me how to reduce it? hi sir,i want to add a led to indicate that its working.can u please tell me where can i add in the transmitter and receiver. Hi Salman the receiver will get damaged (Q4), if the the load resistance connected to output is less than 470 ohms. Sir, is this circuit is restricted to only 9v pp3 battery only? My circuit damaged when i used an adaptor as power supply! Also how to add a amplifier at output? sir can i turn this into wireless communication by connecting a mic at [transmitter] and a pre amp to the output[receiver] then to a speaker.Is this possible??? Hi Kiran see the notes it indicates clearly that you can use any NPN photo transistor. There is nothing called most powerful photo transistor, for higher sensitivity use darlington photo transistor with additional external optical lens. which is the most powerful photo-transistor as all the types are available. is there a condition that the Transmitter should point the receiver or from any where it can reach. I just made this and it works! where should I connect the base of the Q2 photo-transistor? Hi, would these transistors work? Im thinking that i will need them because i can only find 100ma 1.5v ir leds. thanx a lot sir !!!!! u replyng so fast thats so great of u !!!! Are D1 and D2 1.5 volt IR emitters? sir they are not giving me any photo transistor if i asked they are asking for the number of transistor so plz tell me number of any npn silicon transistor which is generally available any where !!!! thanks for speedy reply.your advice information always helpful to beginner like me.Sir do you know what technology is used in IR helicopters [small].If you know please reply me. Hi Kiran to avoid line of sight problem,use RF transmitter and receivers to control your helicopter (normally the rc is supplied as part of equipment by the toy supplier and not available in the free market). i wanted to apply this idea to make a transmitter and receiver for my micro rc helicopter which i have made.Can you please help, I think we have to slightly change the circuit.Can you please tell where and what to connect. Hi Aniket any silicon NPN photo transistor could be used. Thanks a lot! Dear seetharaman. Can you please send me more information regarding “home made photo-transistor” by mail me to: “vrndrsngh85@gmail.com” Your reply shall be hightly appreciated. What audio input shud i use ? ? ? should i usee general purpose mic or anythng else ? ? ? Hi Virender if you have a old optical mouse from which you use. or you can prepare one by using a bc108 or 2N2221. by filing the edge of top portion of the transistor remove the top disc. clean internals with pure alcohol dry and then fix a small transparent plastic disc in the top hole with suitable adhesive. you photo transistor is ready. Hi all, can anyone please let me know how to change Q2 in the receiver side. I could not find any NPN phototransistor like PNZ154, PNA1605F, BPW77NA or BPW85 in our area. Any reply shall be highly appreciated. Plase mail me to :vrndrsngh85@gmail.com. Thanx in advance. Hi Rio the additional cost is not going to give any effect on the receiver. what happens if i put 2 phototransistors? Dear sir, can u plz. let me know how to replace Q2 phototransistor with IR LED. I mean I want to use IR LED by replacing phototransistor in IR Audio Link Circuit. It is possible? Any reply shall be highly appreciated. With thx. Hi Rajesh D1 & D2 are IR diodes. You have to take care of anode and cathode. transmitter and receiver should see each other line of sight is important. This circuit transmits mono signal only. For stereo encoder and decoders are required. The principle of operation is the communication through modulated IR signal. The audio source modulates the IR LEDs they transmit modulated IR beam. The IR transistor in the receiver receive the signal it is demodulated and amplified by Q3 and Q4. For stereo a simple way will be use two identical circuits for each channel. use polarizing glasses for each channel transmitter and receiver. Use vertical polarization for one channel and horizontal for the other. is this circuit transmitt mono signal or stereo signal? If it is mono how can i make this stereo. What is the input voltage of audio signal in transmitter? Can you tell me how is this circuit transmitt and receives audio signals? What is the principle of working of this circuit? Hello seetharaman, I want to use this circuits in some different purposes – like Remote ON/OFF LED bright Light circuit . I want to use TV Remote in this purposes . If I pressed one time in any button of TV Remote then LED will glow and again pressed remote button LED will be OFF . I want to make this circuit with photo transistor . Please don’t say to use CD4017 and Relay . Because I cann’t use it . Because I have a LED light which have 20 LED’s and 4V 0.5Ah Battery which casing too small to establishe Relay and IC there . Please tell me how can I make such circuit with photo transistor ? And about this circuit – It for mono only ! How can I make it for stereo ? I don’t understand why most designer design their audio circuit as mono !! What is the problem with designer to make stereo ?? I really don’t understand !! 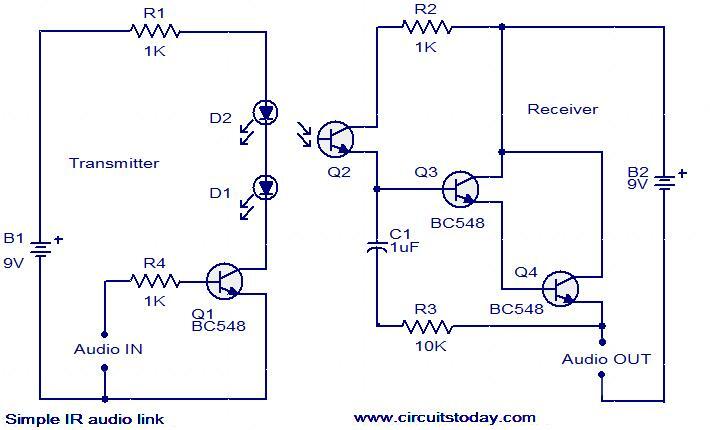 Hi Mohin the output of this circuit, to be connected to a bistable such that its output will go high with one push and with second push it will go lo. To make the above circuit suitable for stereo it will become a dual channel transmission, then you require an encoder to multiplex both the channel signals for sending and a decoder at the receiving end to convert into discrete channels. this will make the circuit complicated as there is no suitable IC available in the market for the same. we will try to develop a discrete circuit in the future. Hi Musthafa Audio input is fed to IR transmitter and the sound is transmitted as modulated IR ray. This ray is sensed by the photo transistor Q2 and converted back to audio signal. the out put can be suitably amplified and listened. This is a cable less audio link. does this circut work, has it been tried and tested. Great site! I am loving it!! Will come back again – taking you feeds also, Thanks. I am very much interested in tracing circuits, though I do not build them. I like to see each and every circuit that I come across. I thank Mr.John for his circuits. Can I give some ideas, as expect any one in your group build them for me? kindly reply.